A stress fracture is a tiny crack in the bone that generally occurs due to repetitive or excessive loading (Patel, Roth, & Kapil, 2011). Most people complain of localised pain that worsens with activity and settles with rest however as a fracture progresses pain may continue even when activity ceases (Astur et al., 2016). Repetitive, high intensity training is thought to be the major factor that contributes to stress fractures with the most at risk populations being athletes, military recruits and recreational runners (Patel et al., 2011). 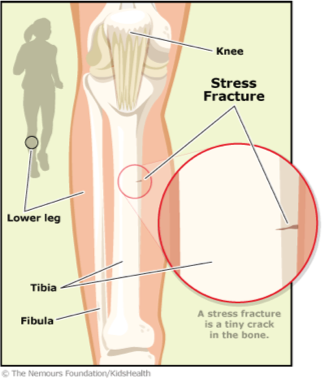 Excessive load  overactivity of cells that break down bone  stress reaction (bone microfractures)  continued activity (stress/load)  stress fracture  break/fracture (if activity continues after stress reaction) (Patel et al., 2011).